Peanuts are usually called as poor men’s cashews or almonds. 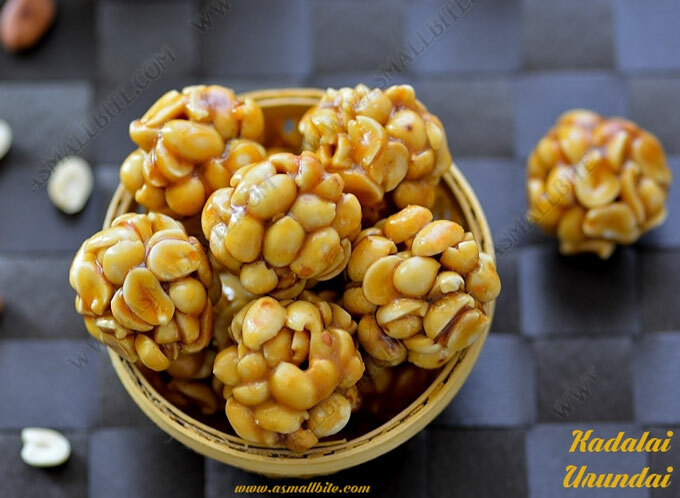 It is a very easy sweet / snack made with just two main ingredients.Though I have eaten it so many times, from my childhood days this is the first time I am trying my hands on this kadalai urundai recipe. 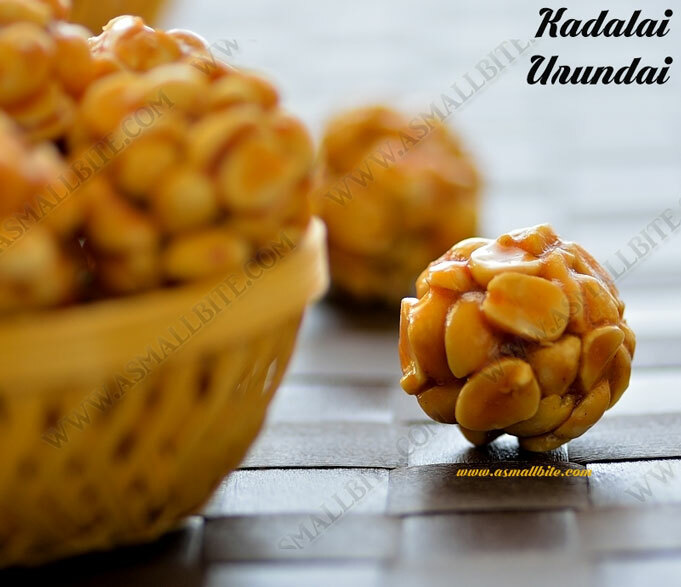 If rolled into balls it’s kadalai urundai. 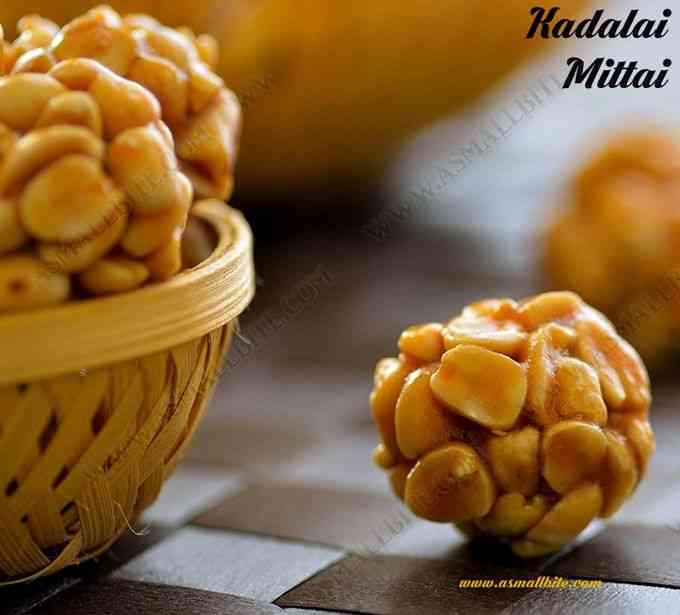 But if poured in a tray and cut into squares, it is called kadalai mittai. 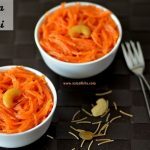 In Tamilnadu, Kovilpatti is very famous for kadalai mittai. 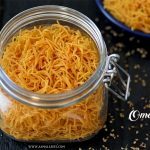 It is said 2 or 3 varieties of jaggery is used along with sugar, liquid glucose and vanilla essence with colorful dried coconut shreds on top. 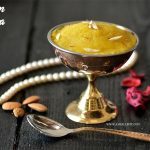 As karthigai deepam is nearing, I thought of sharing this recipe. Do try this and let me know your feedback. 1. In a pan, dry roast peanuts until it crack open and nice aroma arises. Fry till golden brown. Don’t burn it or else it will give bitter taste. It takes about 10 to 12 minutes. Allow it to cool down completely. 2. Take peanuts in both your hands and rub it to remove the skin. Then blow away the skin and halve the peanuts and keep by side. In a pan, add water and powdered jaggery. 3. Heat until the jaggery completely dissolves. Strain it through a metal filter to remove impurities. 4. Pour the filtered jaggery in a pan and keep stirring in low flame. Add cardamom powder, give a quick stir and first bubbles will start to appear. Do the whole process in low flame. 5. The jaggery syrup starts to thicken. Keep water in a small bowl readily to check the syrup consistency. Pour 2 drops of jaggery syrup in the water, if it dissolves the syrup is thin. If it stands firmly in the water, then try to roll into a ball. If you are able to make a hard ball, then it’s the right consistency. Switch off flame. 6. Now add the roasted peanuts to the jaggery syrup. Mix quickly with the ladle. 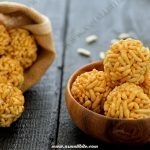 Grease both your hands with ghee, take a small portion and start rolling into balls. If it cools down, it cannot be rolled. But this kadalai mixture can be re-heated again in very low flame for few minutes, the jaggery melts and it can be rolled easily. Once it cools down store it in an airtight container. Stays good for about 10 days. 1. Adjust jaggery as per your sweetness. 2. Roast peanuts for more time to get crispy kadalai mittai. But don’t burn it. 3. 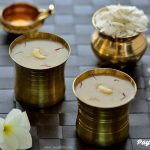 Cardamom powder can be replaced with dry ginger powder / sukku . 4. 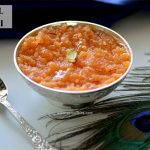 Jaggery syrup consistency is very important for this kadalai urundai recipe. Syrup should be firm that it can be rolled into a ball. 5. Also powdered sugar, rice flour can be greased in your hands while rolling. Else cold water can also be used. 6. If it cools, it cannot be rolled, so do the rolling quickly. 7. If the mixture cools or harden, just heat it 2 to 3 minutes in low flame. The jaggery melts and loosen, so that it can be easily rolled. 8. This mixture can be poured into a tray, greased with ghee and cut into squares. This is kadalai mittai. 9. Stays good and cruncy for about 10 days.